When and How to Hire a Residential Contractor? There is no denying that property management companies save you a lot of time when it comes to dealing with the hectic process of selling or renting your property. Whether it is about handling maintenance, repair issues, responding to complaints, or attracting potential buyers, a property manager can make everything hassle-free and simple. That means a reliable property management company with the right experience and competent team gives you the peace of mind you deserve. However, a property management company also needs the assistance of professional employees who can help them organize and execute everything. To put it simply, good property management companies work in collaboration with professional residential contractors. These contractors help property manager get the property ready for the market. They are remodeling professionals who deal with various kinds of residential projects and incorporate specific designs and architectural ideas to entice landlords or tenants. From installing new windows to repairing floors and cabinets, hiring a professional residential contractor is the right thing to do if you are a property manager or a landlord. You no longer have to worry if you don’t know when and how to hire a residential contractor. We have included some useful information to help you hire a suitable reliable residential contractor at the right time. When You Should Hire a Residential Contractor? A lot of property owners and managers do not realize that a small house or apartment takes at least 4-5 weeks to get completely renovated or remodeled. In order to finish that remodeling job, you likely need a plumber, a cabinet contractor, an electrician, a painter, and a floor professional and an expert who can install appliances. That means it needs a team of workers to get the job done. Here is when the role of residential contractors comes into play. 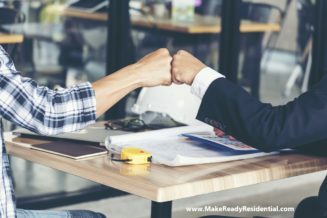 This is the right time you should partner with a residential contractor. The benefit of teaming up with a residential contractor is that he can coordinate with all these professional people and also schedule them. Besides that, a residential contractor is a professional person who is aware of the labor charges; so, you don’t need to worry about your budget. Follow the given tips to hire the best residential contractor. Get recommendations from friends and family before hiring a renovation contractor. Overall, hiring a residential contractor in the right way at the right time will definitely make your property work hassle-free. Contact Make Ready Residential and get the process started!